Casa Loma is a grand mansion on five acres in downtown Toronto built in the early 1900s and famed for its extravagance and size. Today, "Canada's Castle" and its gardens are open to visitors and offers self-guided audio tours in several languages. Casa Loma has also served as the set for several Hollywood movies, including Chicago and X-Men. Casa Loma is the former estate of Sir Henry Mill Pellatt, a Toronto financier, industrialist, and military man. Much of Pellatt's fortune was made through investments in hydroelectricity and railway industries. The mogul hired noted architect E.J. Lennox to build him and his wife a medieval-style castle on a brow overlooking Toronto. Begun in 1911, Casa Loma took 300 men nearly 3 years to complete and cost $3,500,000; for a time, it was the largest residence in North America. Sir Henry enjoyed his new residence for a mere 10 years before financial loss forced him to abandon his grand home. Today, the mansion is owned by the City of Toronto and run by The Kiwanis Club of Casa Loma, which uses its share of the proceeds for charitable projects. Casa Loma is in a primarily residential area of downtown Toronto, not particularly close to other attractions. Visitors planning to walk to Casa Loma should note that the mansion is on a hill brow, meaning an uphill hike. Public transportation options (TTC) will also mean a 10-15 minute walk, in most cases uphill. 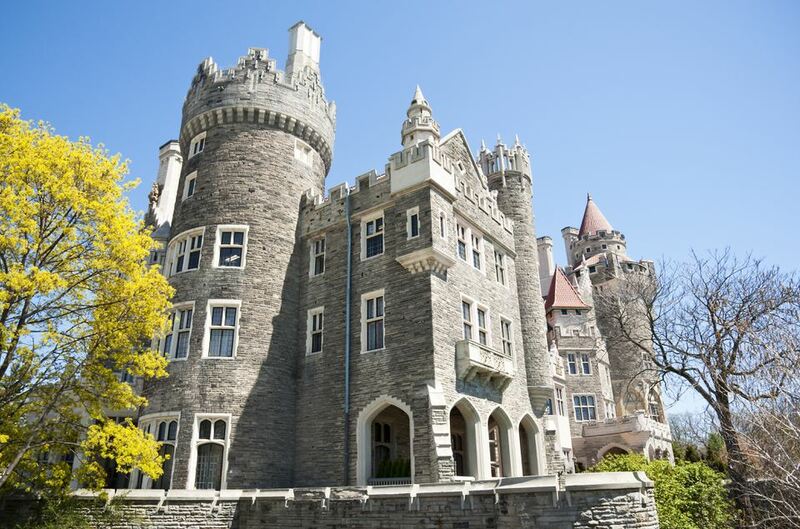 The free self-guided audio tour of Casa Loma and its grounds takes about two hours. Visitors may want to allow more time in warm weather when the gardens are out. Three hours is probably more than enough time to spend, but one hour would be rushed, especially because you don't want to miss the stables and garage. Visit during a holiday or special event. For many holidays, including Halloween, Christmas, and Thanksgiving, Casa Loma has special programming and events in addition to festive décor and furnishings. Further to the previous point, holidays can also mean crowds and certain rooms occupied with special programming, so weigh your options and maybe call ahead to ask a few questions. Watch the movie that is played in the lower level before you start the tour as it gives an excellent overview of Casa Loma's history and the context of Toronto during its construction. Be sure, if you are able, to get to the top of the tower for an outstanding view of Toronto. Don't miss the stables and garage, where an antique car collection is on exhibit. Casa Loma is in a largely residential area, which is itself pleasant to walk around especially given the homes are older and quite grand. Sir Winston Churchill Park, a large urban green space, is near Casa Loma. The park has tennis courts, a ravine, woods, picnic spots, and play areas. The closest shopping area where you'll find gourmet food shops, high-end boutiques, and other professional services is on Spadina Road, north of St. Clair, in Forest Hill Village.